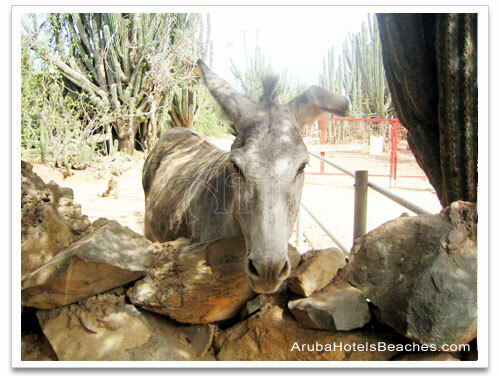 The Aruba Donkey Sanctuary is a sightseeing experience that some tours have on their agenda. Some people are not impressed, while others thoroughly enjoy their experience at the Aruba Donkey Sanctuary. If you are an animal lover this is a must see. If you have children who enjoy animals this is a must see. The donkeys give a friendly welcome to visitors and are fun and full of charm. The Aruba Donkey Sanctuary is a nonprofit organization that is on the island to save and protect the wild donkeys. The sanctuary is run by volunteers and donations only. The donkeys were actually brought to Aruba about 500 years ago by Spaniards to transport both goods and people. Once cars arrived on the island the donkeys were no longer needed for transportation. They ran wild and free and were sometimes abused, killed and left on the side of the road. The Aruba Donkey Sanctuary is a safe haven for the animals where they are fed and cared for by the volunteers. Each donkey is given a name and treated with love and kindness. There is no admission fee and is usually open M-F 9am-4pm and Sat & Sun. 10am-3pm. There is a concession stand where you can purchase snacks and drinks. They also have a gift shop where items such as stuffed animals, key chains, tee shirts, pencils and more are sold. You can purchase a bag of food to feed the donkeys for a dollar at the sanctuary, or bring cut up apples and carrots with you to feed them. We suggest you hide the food when entering the area until you reach the building with the covered fenced porch, otherwise you might find yourself surrounded by donkeys. The donkeys will go over to the porch area to be fed. If you go early in the day, the volunteers will allow you to help with chores, like feeding and caring for the donkeys. The kids really get a kick out of this. 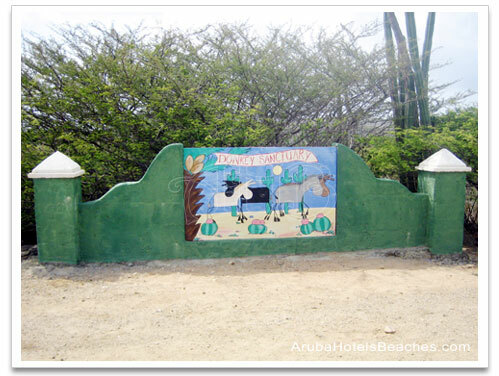 The Aruba Donkey Sanctuary has a kids club called Amigo Di Burico Kids Club. Once a month kids 8-12 years old come to the sanctuary on a Sat. morning to help care for the animals. They even have Kids Birthday Parties. Some people will spend only 10 minutes at the sanctuary and leave. Most visitors enjoy petting, feeding, and caring for the sweet animals. You will also learn many facts about donkeys while you are there from the friendly volunteers. Remember to leave a donation if possible since that is the only way these volunteers can keep doing the work that is needed to keep these animals safe. Whether you stay 10 minutes or an hour at the Aruba Donkey Sanctuary is your choice, but check out Baby Beach after your visit to cool off.